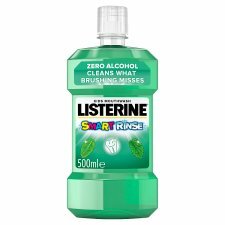 Listerine® Smart Rinse® is a fluoride mouthwash that helps protect your child's teeth against cavities when used twice daily after brushing. Contains Fluoride, which strengthens teeth and reduces cavities by up to 40% more than brushing alone. Fights bad bacteria, a major cause of plaque and gum disease. Goes around the whole mouth, reaching teeth, gums and tongue. It attracts and tints the bits that brushing misses, showing your child the proof in the sink. Not to be used by children under six. Do not use it bottle seal is broken when purchased. Directions: Use twice daily morning and evening alter brushing. Pour 10 ml (2 x 5 ml teaspoons) into a glass, rinse around teeth and gums for 60 seconds, then spit out. Supervise your child to minimise swallowing.